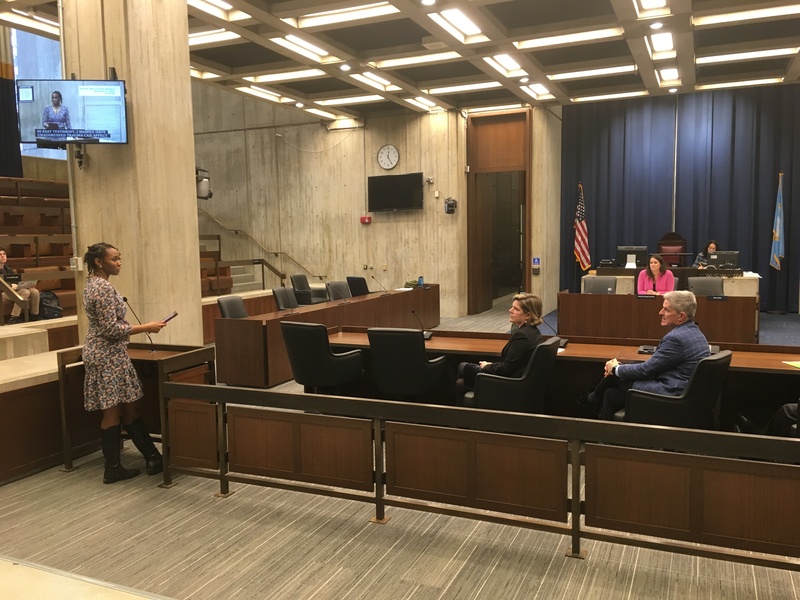 On Monday, December 3rd, E4E-Boston Executive Director Brandy Fluker Oakley and Outreach Director, Jake Resetarits, testified at a City Council hearing regarding mental health support staff and relationship building in schools as it relates to suicide prevention. In their testimonies, Brandy shared personal experiences and Jake shared stories from E4E-Boston members Theresa Thalhammer and Matt Clark. Brandy and Jake highlighted the need for students, especially those who have experienced trauma, to have more access to mental health support staff. They also called for more schools to prioritize relationship building between students and trusted adult figures. While having this conversation is an important first step to addressing this issue, Brandy and Jake reiterated that action must be taken to ensure that funding is allocated for psychologists, counselors, and social workers to be present in every school. Schools must also continue to be supported to emphasize relationship building that goes beyond just academic achievement. Below is the written testimony that was submitted to the City Council. We at E4E-Boston know that the holidays are a particularly difficult time of year for those struggling with depression. If you or someone you know might be in danger they can call or text 1-877-870-HOPE(4673) for anonymous 24/7 support. Testimony Presented on December 3, 2018 at 12:26 p.m.
Good morning President Campbell and Honorable City Councilors. My name is Brandy Fluker-Oakley and I am the Executive Director of Educators for Excellence-Boston, a teacher-led nonprofit that works to elevate educator voices in the policymaking process. Thank you for providing me with the opportunity to speak to you again this morning about the need for more mental health support staff in our schools. and comprehension. However, today, I want to speak to about this issue specifically through the lens of suicide prevention. When thinking about individuals who are susceptible to attempting suicide, there are two prototypes that emerge: those that express their depression and hopelessness outwardly, and those who present a facade, keeping their struggles within. It is people in the latter prototype who are most likely to fall through the cracks, a fact I know because I was almost one of those people. On the surface, I appeared to have it all together. I was attaining a post-secondary degree, being exposed to numerous professional opportunities, physically healthy, and achieving a level of success in my life that would lead outsiders to believe that I was thriving. However, that was not the case internally. My thoughts towards myself and other life happenstances were chipping away at me. The weight of my internal world had become too much. What my struggle has taught me is the importance of strong trusting relationships. I was lucky. I had built a relationship with an employee at the university that I attended and thus I had someone I trusted. When I was at my lowest point, she asked me how my weekend was. I could have let this otherwise innocuous question pass by without revealing my inner emotions, but because we had built that trust I was able to confide in her in my moment of need. She pointed me in the direction of counseling services. I am only here today because of that trusting relationship and access to experts. Right now, in our schools, many students have neither trusting relationships like the one I had nor access to mental health experts who are trained to identify the signs and risk factors and who can provide the support needed to help someone like me. Beyond not having an adequate number of mental health support staff to meet the recommended ratios many psychologists, social workers, and counselors serve multiple schools. This makes it incredibly difficult to build trust and relationships with at-risk students. Our teachers have spoken out about the importance of teachers establishing trust and building relationships with students. These trusting relationships ensure that students feel there is someone they can confide in when suicidal thoughts occur, just as I was able to. Our teachers have highlighted as well the need for mental health support staff and that those people be permanent in the building. This ensures there is someone else in the school who will build relationships with students and counsel them. My colleague Jake will share some of our teachers’ specific perspectives who could not be with us this morning. I applaud you for raising this important topic and I hope that this conversation will result in action. Open discussions like the one we are having today will go a long way in reducing stigma and silence around this issue. Thank you for your time and for all that you do for the people of Boston. Testimony Presented on December 3,2018 at 10:43 p.m.
Good morning President Campbell and Honorable City Councilors. My name is Jake Resetarits and I am an Outreach Director for Excellence-Boston. As Brandy mentioned, I will be sharing some quotes from teachers who could not be here in person today. Thank you for providing me with the opportunity to share their thoughts with you. As part of our efforts to elevate teacher voice, E4E-Boston surveyed more than 1,000 Boston educators about their experiences over the course of the 2016-2017 school year. Ninety-one percent of these educators stated that student trauma poses a major challenge in the classroom. In addition, in a survey this fall, over 500 educators overwhelmingly identified building strong relationships as the key factor to focus on when working to improve school culture. Matt Clark, a teacher at West Roxbury Academy, also shared a story about a student with the pseudonym Catherine, whose emotional pain was keeping her from attending school. The student opened up to her teacher about what she was going through and he was able to call a meeting with himself, the student, and the school psychologist. The school psychologist ensured that Catherine would be safe in the immediate future and created a long-term plan for her success. Immediately after this meeting, they observed a drastic improvement in Catherine’s attendance and academic performance. But it took the collective intervention of a teacher, a guidance counselor, and the school psychologist - as well as Catherine’s family. Strong relationships are essential because without them the problem might not have been surfaced in this way. Our students need access to mental health support staff and schools must prioritize relationship building between students and staff beyond just academic support. In addition to raising this essential conversation, the City Council should ensure that funding continues to be allocated to hire more psychologists and counselors for schools to get us closer to recommended ratios and that the district is prioritizing social emotional wellness for educators and students. We also need to continue to encourage schools to support educators and other school-based staff to build bonds of trust with their students, and for adults to develop an awareness of student trauma. Thank you very much for taking the time to listen to my testimony and for your continued efforts to support Boston’s next generation.